One of the reasons we partner with Red Star Yeast is because they have great recipes. This recipe for Eggnog Cinnamon Rolls is on their website, and has been modified to show how we used our EZ DOH mixer to do nearly everything in our EZ DOH container. Place eggnog in a saucepan over medium heat and bring just to a boil. Combine the sugar, the salt, and the butter in your EZ DOH container, then pour the hot eggnog over it and let it cool to 110-115 degrees F.
Add egg and yeast to the cooled mixture, and mix well with wooden spoon or dough whisk. Add the nutmeg and flour, and hand-crank the dough thoroughly for at least 4 minutes until the dough is smooth and elastic. Remove the dough from the container and lightly grease the EZ DOH container to minimize sticking, then shape the dough into a ball and place back in the container. Cover with plastic wrap and allow it to rise until it doubles in size (will take at least an hour). Grease and set aside a 9 x 13 inch pan. Punch the dough down, place on a well-floured surface, and roll it out into a 10 x 14 inch rectangle. Brush with the melted butter (filling ingredient). Combine the other filling ingredients (sugar and cinnamon) in a small bowl, and then sprinkle the mixture over the buttered dough. Starting at either of the long sides of your rectangle, roll the dough up, then when it's all rolled up pinch the seam to seal. Using a serrated knife (we used a sewing thread), cut the dough into 2 inch thick slices, and place them (so you can see the swirls staring up) in the greased pan. Cover with plastic wrap and let them rise one more time (until doubled in size), which should take an hour. Pre-heat the oven to 350 degrees F. NOTE: While the rolls are baking is a good time to prepare the icing (see below). 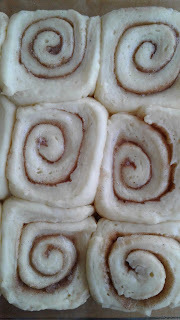 After the rolls have risen the second time, bake until golden brown (about 25 minutes). Let cool for 5 minutes. 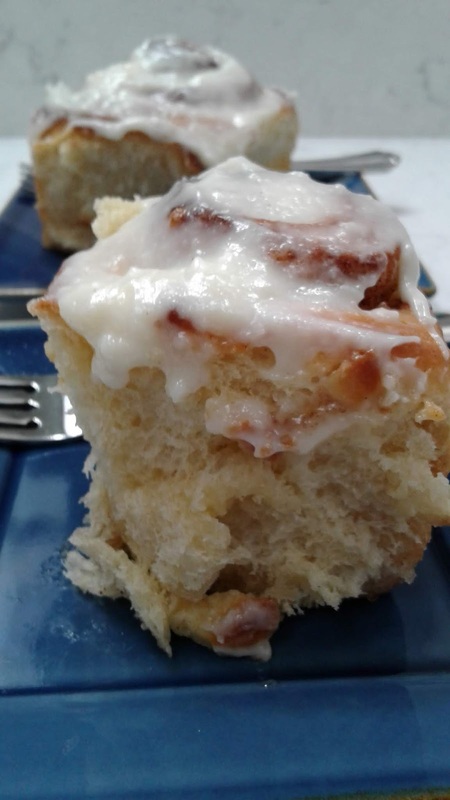 Spread the icing on the rolls and enjoy while still warm. Mix all the ingredients together until smooth. If too thin add more powdered sugar, and if too thick then add more eggnog. NOTE: Original recipe created by Sweet Recipes.